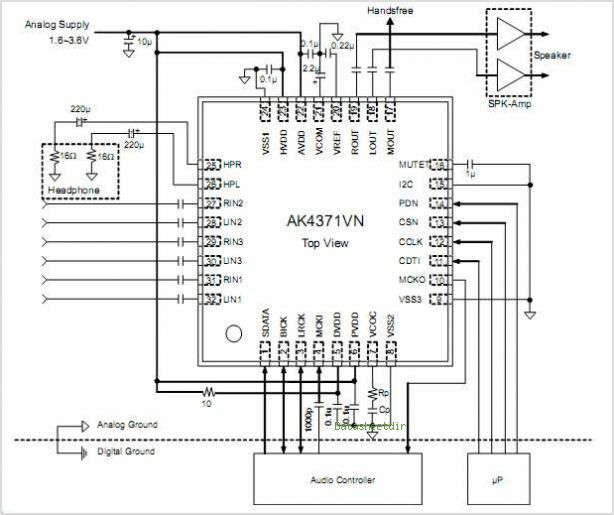 The AK4371 is a 24-bit DAC with an integrated PLL and Headphone Amplifier The PLL input frequency is synchronized to typical mobile phone Clock frequencies. The AK4371 features an Analog mixing circuit that allows easy interfacing in mobile phone and portable Communication designs. The integrated Headphone Amplifier features pop-noise free power-on/off, a mute control, and it delivers 40mW of power into 16. 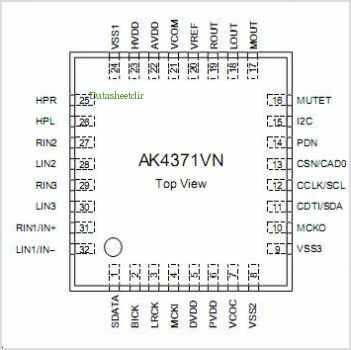 The AK4371 is packaged in a 32-pin QFN (4mm4mm) package, ideal for portable applications. By AKM Semiconductor, Inc. This is one package pinout of AKD4371,If you need more pinouts please download AKD4371's pdf datasheet. This is one application circuit of AKD4371,If you need more circuits,please download AKD4371's pdf datasheet.